Central to the student experience of Global Innovation Design is immersion in radically different design cultures. When KMD students traveled to New York for the GID Pre-Program hosted by Pratt, they discovered what it's like to learn and work in a traditional art school environment. There are many differences between the design culture of KMD and the culture of Pratt. KMD students are used to working in teams on their design projects. But at Pratt, almost all projects are done individually: the goal is for each student to develop his or her unique voice as a designer. By working alone, each student must take responsibility for learning all aspects of a product development cycle: concept, prototyping, engineering, aesthetic, production. The physical work environment of Pratt supports this individualized education style. Every student gets his or her own personal workspace in a design studio shared by students at the same level. Even though the work is individual, students are not isolated from each other. They constantly interact in the studio, asking for advice, socializing, commiserating over deadlines, etc. A personal workspace means works-in-progress can be left in fragile states of development over days or weeks. Paints, materials and tools can be left in place, ready to resume work at a moment's notice. As one Pratt student said, "my desk is a home for my mess." Giving students opportunity to make a mess follows the tradition of a fine art studio, conducive to extended creative exploration and refinement of forms. Students at KMD, in contrast, have only shared workspaces, so works-in-progress must always be easily moveable to storage. Tools and materials must be put away at the end of every work session and retrieved at the start of the next. While apparently inconvenient, this work style encourages rapid iteration by breaking work sessions into distinct units. Sessions begin and end with a physical reconfiguration which creates natural, repeated opportunities for conceptual reconfigurations as well. While personal space supports individual project work, shared space supports creative teamwork. There's ample space for groups of people to gather, sit together, discuss co-developed prototypes, and move seamlessly between collaborative discussion and individual tasks within the same workspace. Shared space can also be used by many different people for many different purposes over the course of a single day. As you can see, these different kinds of workspaces — personal versus shared — put different constraints on creative practice. Each has its strengths and weaknesses, supports a different kind of work style, and different kinds of interaction between students. 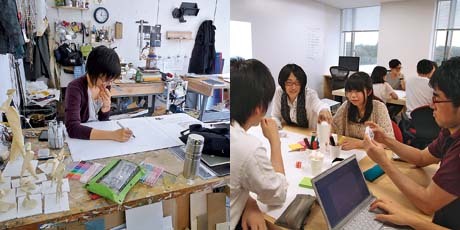 Students in the Global Innovation Design Program have a unique opportunity to travel between very different kinds of work environment and learn the different kinds of creative practice that each affords. (The workspaces at RCA/Imperial, by the way, are similar to Pratt by providing dedicated personal space.) This is just one of many ways that GID students benefit from their trans-national design education, preparing them to become flexible creative leaders capable of working with diverse kinds of designers in diverse environments. © 2013 KMD / PRATT / IMPERIAL / RCA, ALL RIGHTS RESERVED.